This month’s Cook the Books Club selection was Sustenance and Desire, something very different from the previous books: it was an anthology of short stories and poems! All about food, of course! As is true to most works like this, I loved some, I loathed some, some excited me, and some made me want to stab my eyes out with a pickle fork. So well done to the editor, I would say. 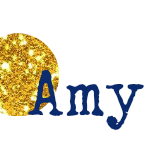 (My GoodReads review is basically what you read above, but check it out here if you wish). There was no shortage of cooking inspiration. The ones that drew me were mostly sweets: chocolate chip cookies, gelato, and pie…with artichokes and French fries thrown in the mix. Ultimately the fries won out. I’ve made fries over and over again on this blog, so I thought I’d round them up and then share a yummy recipe to go with the fries! What are French fries without a burger or some chicken nuggets? My boys (like some many others) absolutely love some nuggets from a certain fast food restaurant. But I (like most mothers) ration out fast food nuggets for special occasions, or when we’re traveling. So I started making a crunchy baked version of their favorite at home. I was nervous at first, I mean, crunchy onions? Kids? It seemed doomed to failure. Then the kids inhaled them! And Dude proclaimed that they were even better than the fast food version!!! What?!?! A fluke, surely. Then they got requested weekly for the next 3 weeks. These are the best homemade chicken nuggets in the land. My picky children said so! Preheat the oven to 400 degrees F and place a wire rack on top of a baking sheet. Place the fried onions, flour, parmesan, and pepper into the bowl of a mini food processor (alternately, crush in a large zipper bag) and pulse 2-3 times to lightly crush the onions and mix. Place the mixture in a shallow bowl. Beat the egg and place in another shallow bowl. Dredge the chicken strips through the egg. Then place in the bowl with the crunchy onion mixture. Press the onion mixture onto the chicken strips. Place the crusted chicken onto the wire racks. Once all of the chicken is coated, place the baking sheets in the oven and bake for 20 minutes or until the coating is browned and chicken is cooked through. Serve with a side of BBQ & honey mustard sauce and a side of fries. I am still working on this book....I keep forgetting about it LOL...Oh well I still have a month. Great fry roundup Amy. I love that you picked a Neruda poem for your cooking inspiration. He wrote so divinely. I thought about the Neruda, too...but the one about artichokes. In the end I did a braised duck with vanilla bean sauce from Natasha Sajé's "Creation Story." I love how we were all inspired by different pieces. I was tempted by Neruda and his ode to fries as well! 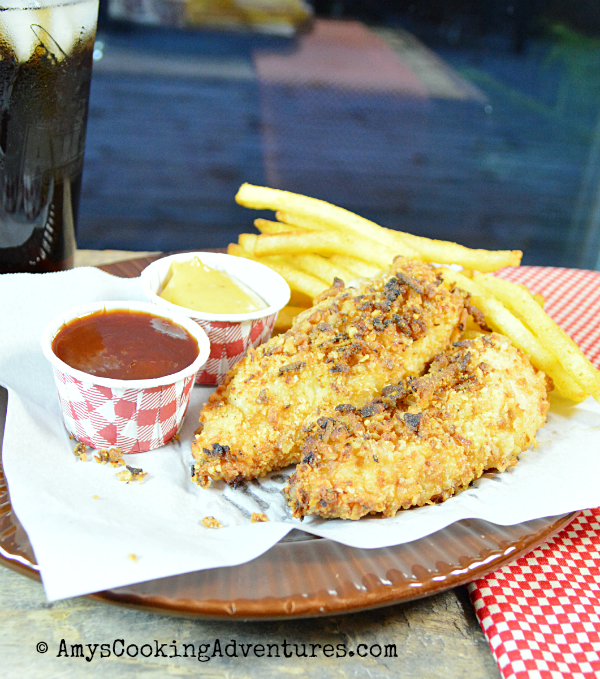 Thanks for sharing the chicken finger recipe! Oh boy, your post made me seriously hungry for Chicken Nuggets and fries. Ack! But you did the healthy oven baked version, so I'm doing it really soon. Thanks for the good recipes. "...and some made me want to stab my eyes out with a pickle fork." --that totally cracked me up! ;-) Out of all of the offerings in the book "Ode to French Fries" is the one that had me drooling. There is nothing like a really good French Fry. 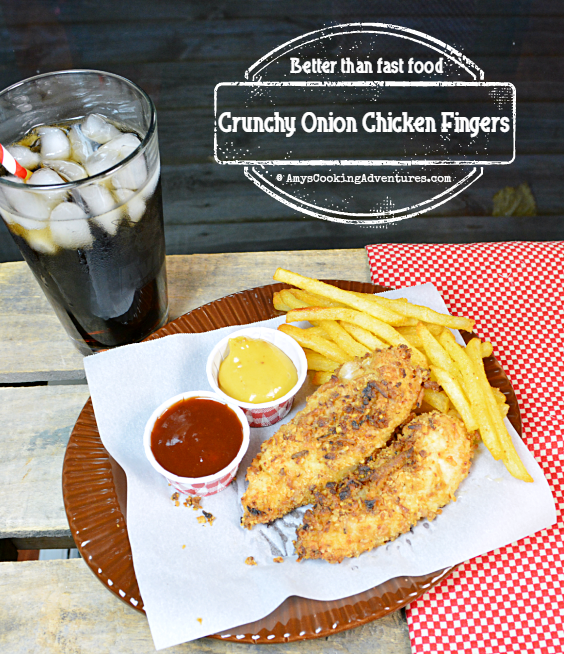 French-fried onions are one of my favorite toppings and I love that you used them for chicken fingers. Perfect! 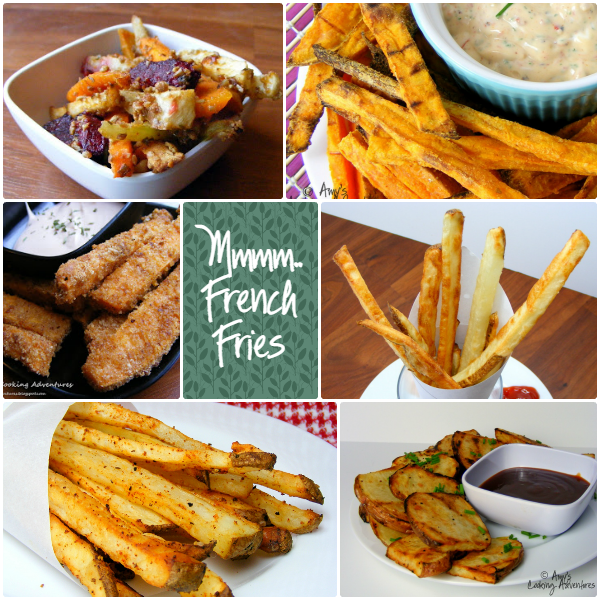 Nice roundup of French fries. I enjoyed Neruda's poem as well.